Description: The message of life can be promoted in the popular rubber-bracelet format using uplifting and positive messages. Perfect for any teenager and great for everyone else, these are priced so low you can afford to give them away! Bracelets are 8 inches circumference. A bold but quiet witness. I keep these wrist bands by the hundreds, and people stop me in restaurants, public places, and churches. They ask where can I find these? I pass them out everywhere I go. Wear well & hold up well. Great freebie for any display!!! 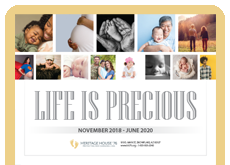 I had these scattered about our pro-life table at my church and people enjoyed looking at our fetal models then getting to take a bracelet and/or button. We are very pleased with the quality, bright color and clear message of the pro-life bracelets. We have used them as a teaching tool during Respect Life Month in October. Then each child in class received one to keep. They were so excited. The youth loves these bracelets. They are a reminder of their stance on abortion. I just could not let this off my wrist! The color is very catchy and the message is undeniable. I was able to buy and share a few during the 40 Days for Life 2013 Fall Campaign. Very popular! These are a nice quality band that always appeal to the upper teens and young adults. These blue pro-life ones have long been our most popular bracelet for men and women. Kids of all ages love these bracelets. They would have been more popular if they had a second color though. At our pro-life booth at the county fair, we try to have something for all age groups and these bracelets are a huge hit with teenagers. They are the perfect complement to the Just 4 Girls/Just 4 Guys publication! My daughter received these from the pro-life group at church. She is only three, but loves wearing it and yelling:"I love babies!" We have used this bracelet at our local county fair booth for the last 4 years. They are a wonderful draw to our booth and conversation starter about what it means to be pro-life. I have given out hundreds of these wrist bands at my pro-life booth, during speaking engagements and during rallies and walks for life. Students love these and commit to pray for the end of abortion everyday they wear them. This is a great tool to use to keep the pro-life message in everyday discussion. I wear a Prolife and a Life is Precious bracelet every time I go out for the day. I also use these at our local Fall Festival where I have a prolife booth. The response among the teens is great. We have handed out many of these to teens and adults. they love them. Thanks for making all the prolife materials easy to purchase. I passed these out at my Students for Life table at a campus event a few days ago, and I only have a few left! I'm going to have to buy more of them, since they were so popular. They are very sturdy and very simple. The color is gender-neutral, so guys and girls alike were taking them. My only criticism is that the words a bit difficult to read, but besides that, it's a great product (and a great price, if you get them in bulk!). I recommend them. These bracelets are great to give out on Respect Life Sunday & to youth groups. Our ministry has also used them as admission bands into our dances instead of hand stamps. I've had mine for years & they hold up really well.